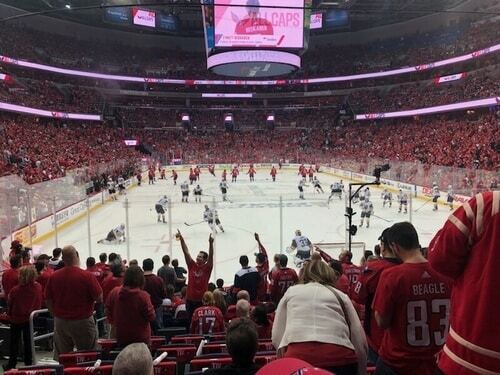 From the moment the pre-game arena lights dimmed, until the final train horn sounded on the Caps 3-1 victory over Las Vegas on Saturday to take a 2-1 Finals lead, it was a night to remember in D.C. for long suffering hockey fans. As a guest of Capital One for the evening, I saw thousands of people join together under the banner #ALLCAPS in a way that hasn't been done in a very long time. It was the first home championship round game of any kind in the nation's capital in 20 years. Chinatown and the blocked off streets were a sea of red, and as festive as Mardi Gras. Beloved hometown baseball coach Joe Gibbs ignited a galaxy of lightsticks before the game with a deafening chant of "Let's Go Caps!" at Capital One Arena. It was an electric atmosphere – something not seen inside that arena in a long time. It's great for the city and great for fan base begging for the euphoric feeling of a championship. To imagine a team like this one, led by future Hall of Famer (I hope!) Alex Ovechkin, standing on the doorstep of a championship is the stuff of dreams. For many years, the Capitals' post-season failures have become a source of dread to the faithful, and ridicule for our rivals. This year, the script seems flipped. The bad luck of previous years has turned into timely good fortune. The teams that once froze in the moment, has given birth to a team that is rising to overcome adversity. As I left Capital One Arena, I soaked it all in, and made sure to grab an Alex Ovechkin jersey for my collection. I own a handful of "t-shirt" jerseys, but not the real deal. I also wanted one with the official Finals patch on the front. Since production time was so short, you could buy the patch at the souvenir stand, and there was an iron press station on the concourse where two attendants were affixing the patches for free. About 90 seconds later, the newly minted Ovie 8 sweater with the Captain's "C" on one chest, the glorious Finals patch on the other. All of it, a sweet 20% off thanks to buying it at the arena with my Capital One card! They say the hardest win is always the 4th win in any hockey playoff series and the Capitals have two more to go, not just one. Another crushing heartbreak remains undeniably in play. But this year feels different. It just does. Ask any of the faithful in red in that building yourself. 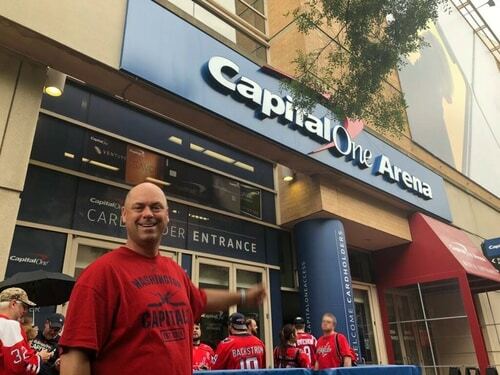 Czaban, a D.C. sports radio personality on 980 AM, has been a Caps fan since the beginning. He'll see all of you at Game 4 Monday night.